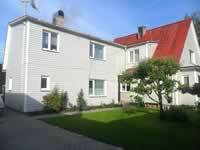 A two-storey Holiday Cottage is located on the outskirt of Pärnu, on a quiet residential neighbourhood, just 600 m from the sea. the guests have at their disposal the first floor of the cottage (separate entrance) with a living room, recreational room, 3 bedrooms, kitchen, small shower room, WC. The interior is not modern, but is suitable for holiday-making. Living room is furnished with couch/bed, armchair, coffee table, shelf unit, TV, music centre. Three bedrooms have beds for altogether 6 people (up to 3 additional beds available, if required). Each room has its own TV. Kitchen is equipped with electric stove, refridgerator, microwaveoven, coffee machine, water cooker, utensils. Washing machine. Separate WC and shower room. A closed yard is available for sitting and barbequing. Possibility to rent bicycles.